exposarazzi: TMI Tori strikes again! Tori Spelling doesn't hold back in her new book, but maybe she should? TMI Tori strikes again! 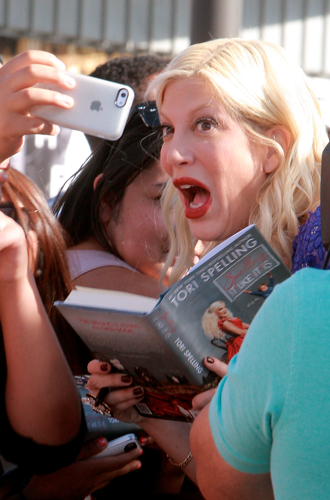 Tori Spelling doesn't hold back in her new book, but maybe she should? How did Star magazine miss THIS excerpt from Tori Spelling's new book Spelling It Like It Is? Pg 14: "When I met Dean [McDermott] I went from sharing nothing with my partner to telling Dean everything. TMI is the story of our lives. We regularly share the size, color, and length of our shits. We beckon each other to the toilet to lean in and get a good look. Unfortunately, our kids have picked up on this habit too. There are photos on my phone of the most impressive McDermott family shits. Instagram, eat your heart out."